The Economy is No Peach, But This Ice Cream Sure Is! My alternate title for this blog post was: “Tired of waiting for QE3*? 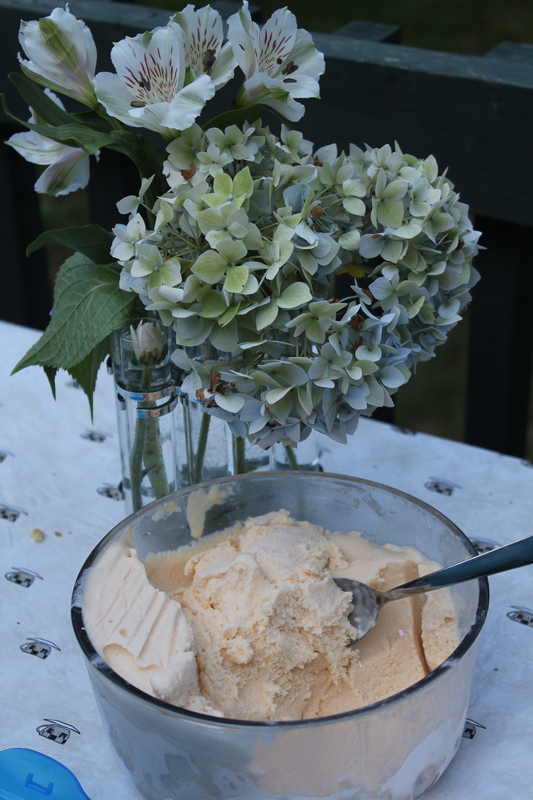 This peach ice cream will ease your mind!” What a week to be an economist with food sensitivities – there is certainly no shortage of reading material! At our most recent picnic celebrating family togetherness and my sister-in-law’s birthday, my MIL created a delicious homemade peach ice cream. In her first batch she used regular sugar as the sweetener, and in the second batch she used honey. They were enjoyed greatly, and those who tried both did not notice a difference in taste. Now that’s a positive indicator! Bring a large pot of water to a boil. Lower in peaches and poach for 1 minute. Remove and slip skins off under cool running water. Discard pit and put peaches into blender. Blend peaches with half of the honey. Swirl until smooth, 1-2 minutes. Chill an hour or more. Mix in separate bowl: cream, milk, remaining honey and vanilla. Chill an hour or more. Churn: Give cream mixture a good stir. Pour into an ice cream maker and churn until thick (about 15-20 minutes). container and freeze. Let warm 10 minutes at room temperature before scooping. Best if used within two weeks. 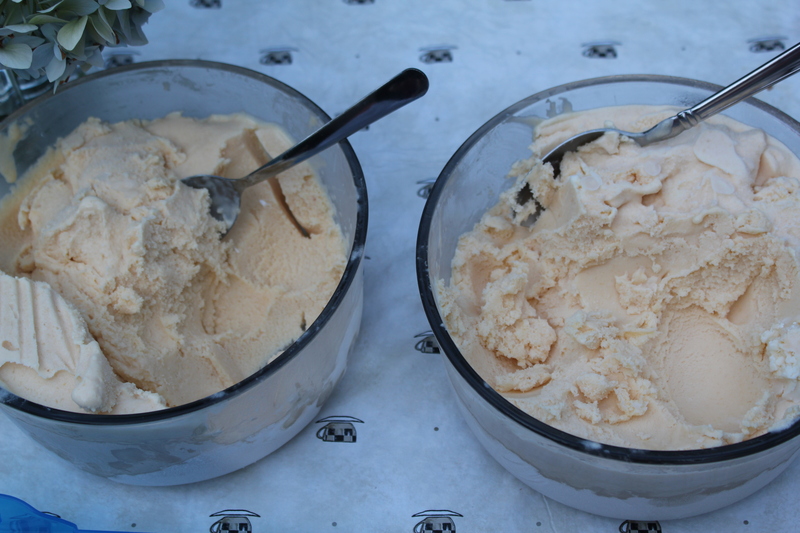 As shown in the photo, the sugary and sugar-free versions of this delicious ice cream look quite similar. *QE3 refers to the potential third round of quantitative easing by the U.S. Federal Reserve. It is an economic stimulus approach by which a central bank purchases bond assets, either government or private sector, in order to depress medium to long term interest rates and to encourage investors to spur the economy by putting their money elsewhere. I am also sharing this recipe with Simply Sugar and Gluten Free, Something Swanky, Joy of Desserts, Two Maids a Milking, Beauty and Bedlam, This Chick Cooks, The Lady Behind the Curtain, Food Trip Friday and Sweet as Sugar Cookies. This entry was posted in Economics, Recipes - Dessert and tagged Cane sugar free, Homemade peach ice cream, Honey, Ice cream, Peaches, QE3. Bookmark the permalink. Delicious! Knowing where to “put money elsewhere” would be a great tip–just kidding! Love the title and laughed all the way to the freezer for….you guessed it…..a bowl of peach ice cream….it was sooo good! I love anything with peaches. Thanks for sharing this recipe at Cast Party Wednesday. I hope to see you again next week. I appreciate your kind words. Have a good day. Yum! I love that the ice cream is free of refined sugar. Peaches are so delicious! How I wish I have an ice cream maker right now. I am craving for some ice cream even if I have a bit of a sore throat. But hey, I love eating comfort food when I’m sick. Visiting via Food Trip Friday.